Hip osteoarthritis can cause pain and limit your hip’s mobility and range of motion. Hip replacement surgery can help reduce pain and restore the functionality of your hip. Hip replacement, which is also known as hip arthroplasty, is a hip surgery that is commonly performed on older patients. Total hip replacement can help increase your hip’s range of motion, decrease pain, and allow you to partake in everyday activities that were once impossible due to discomfort. What are the parts of the hip? The hip joint is a ball-and-socket joint that allows for fluid leg and hip movements. The acetabulum is the name given to the hip socket that forms a cup-like structure that houses the ball-shaped end of the femur (thigh bone). The ball-shaped portion of the femur is known as the femoral head, which sits smoothly in the hip socket, with layers of cartilage between the bones to reduce friction. The muscles of the thighs and buttocks wrap around the hip. What can hip surgeons achieve with total hip arthroplasty? If hip pain or discomfort has affected your everyday life and limited your ability to use your hip properly, hip replacement surgery can treat arthritis of the hip joint and restore a wider range of motion. Hip arthroplasty replaces the femoral head with a ball-shaped piece of metal that sits comfortably within the hip socket. Hip replacement surgery is designed to alleviate the pressure of bone-to-bone contact between the hip socket and femoral head, which may occur as the cartilage degenerates with age. Total hip arthroplasty can help a patient regain hip and leg mobility and return to everyday activities. What should I expect before hip replacement surgery? If you and Dr. Rozbruch have decided that the best course of action to treat hip pain is to undergo total hip replacement, a physical examination is usually needed to ensure that you are a proper candidate for hip replacement surgery. Prior to hip surgery, you may also meet with a physical therapist who will be working with you during your recovery period. In some cases, you may begin physical therapy before undergoing hip joint replacement, as your physical therapist may need to understand what exercises you are able to do prior to undergoing surgery. This information can be compared to your ability to do certain exercises post-operatively. Information on hip pain, limited mobility, or an inability to do certain physical exercises may be recorded prior to total hip arthroplasty. Physical therapy prior to hip surgery may also benefit you by helping you become familiar with certain physical exercises that you may partake in after hip replacement surgery. During these physical therapy sessions, your physical therapist may introduce a cane, walker, or crutches that you will need to become familiar with, as you will use a walking device as your hip heals. Additionally, your physical therapist will teach you what ways you can move your hip as it heals from hip arthroplasty. It is important not to twist or move the hip in a way that promotes dislocation following your hip procedure. There are 2 main types of hip replacement surgery, including hip surgery with a cemented artificial hip joint and hip surgery with an uncemented artificial hip joint. In addition to understanding the specifics of hip replacement surgery, it is also very important to have a working knowledge of the artificial hip joint. 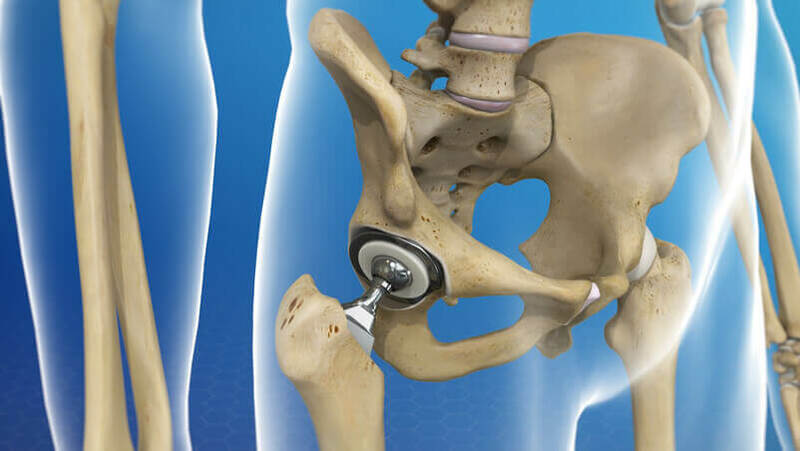 The artificial hip joint is designed to act and function just like your natural hip joint. 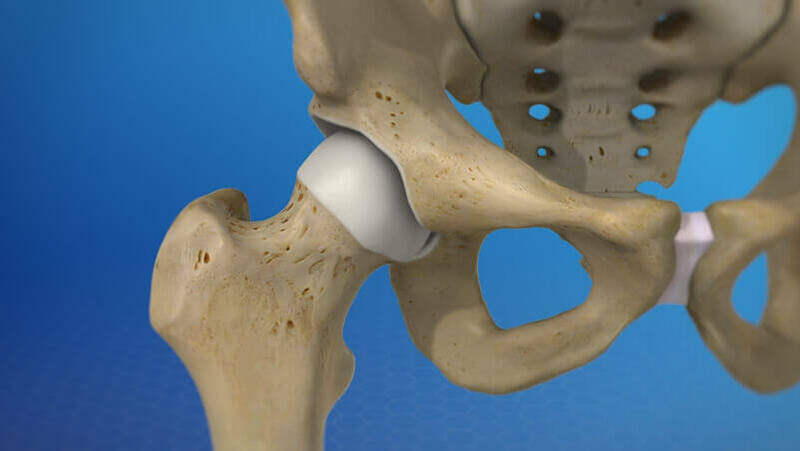 A cemented artificial hip joint is firmly held in place through an adhesive cement that can firmly connect the metal hip joint with your natural hip socket. Conversely, an uncemented artificial hip joint does not use cement. Instead, uncemented artificial hip joints use a mesh-like material that promotes bone growth and attaches the metal joint to the hip socket. Dr. Rozbruch will help you determine what hip replacement technique is right for you. Each artificial hip joint is made of 2 parts known as the femoral component and acetabular component. The femoral component is the stem and ball-like structure that replaces the top of the femur bone during hip replacement surgery. The artificial femoral head is usually made of metal, but some of the ball-like structures may be made out of ceramic. The femoral component is connected to the acetabular component, which replaces the socket of the hip. The acetabular component is often made of a metal shell with a plastic lining. This helps reduce the friction between the femoral component and socket. Dr. Rozbruch will begin your hip replacement surgery by making an incision on the side of the thigh. This incision will allow Dr. Rozbruch access to the hip joint. He will then locate the femoral head and carefully remove it from the hip socket. The femoral head is then surgically removed from the femur. Any cartilage within the hip socket will be removed. The hip socket will then be reshaped to resemble a half sphere. 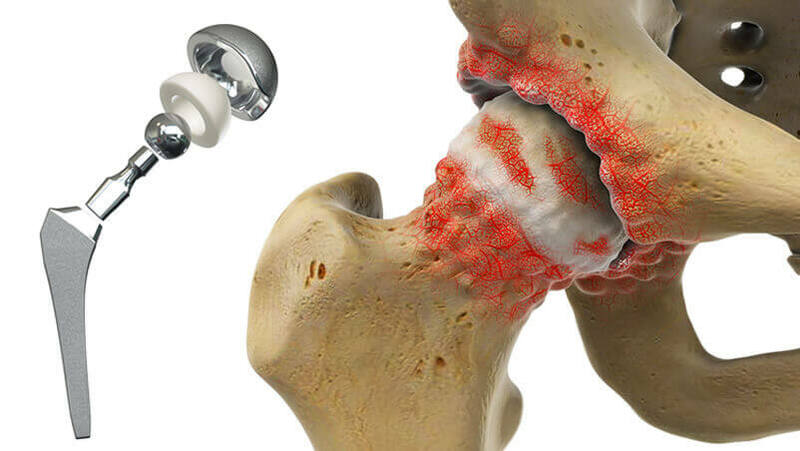 Reshaping the hip socket allows the artificial hip joint to tightly fit within the socket. Specialized filing tools are then used to shape the inside of the femur to fit the metal stem of the femoral component. The stem of the femoral component is inserted within the femoral canal. Multiple sutures may be used under the skin to promote healing. Stitches or staples may be used to close the external incision on the skin. The incision will be neatly bandaged while you are moved to a recovery room. Does Dr. Rozbruch offer revision hip replacement? Dr. Rozbruch does offer revision hip replacement surgery for patients requiring an additional hip arthroplasty. If you have experienced complications from undergoing hip replacement surgery by a less skilled orthopedic surgeon, Dr. Rozbruch can help correct these complications during revision hip replacement. It is also common that patients who underwent hip replacement surgery may need to undergo revision hip replacement after a certain number of years. The artificial components used during hip replacement surgery experience the same wear and tear that the natural hip joint experiences. After a certain number of years, your artificial hip replacement may need to be replaced in order to continue working properly. Revision hip replacement can remove damaged or worn hip prostheses and replace them with new artificial components. Revision hip arthroplasty can help you regain mobility in your hip and leg. What should I expect after hip replacement surgery? Following hip replacement surgery or revision hip replacement, medical stockings may need to be worn to reduce the possibility of blood clots forming. Your incision will also be padded and dressed with clean bandages to promote healing. A special cushion may also be used to keep your legs comfortable immediately following total hip arthroplasty. Initially, a nurse may ask you to perform simple breathing exercises to ensure that your lungs are working properly after hip replacement surgery with general anesthesia. Improving breathing can also help reduce the possible onset of pneumonia. Physical therapy 1-3 times daily will begin while you are staying overnight at the hospital. The first step of physical therapy is to help you learn how to move comfortably in and out of bed. After learning how to comfortably leave your bed or chair, you will begin to take light walks using crutches or a walker around the hospital floor. Dr. Rozbruch will notify you of any restrictions you may need to abide by during your recovery. Knee and ankle exercises may be introduced to reduce swelling or blood clots within the legs. Light toning exercises can also help begin to strengthen the hip and thigh. The majority of patients can return home 4-7 days after a hip replacement or revision hip replacement. Once you are home after your hip arthroplasty, your physical therapist may meet you at home for a physical therapy session. This visit is to ensure that you are healthy, moving, and not experiencing any negative symptoms. It is important to use your walker or crutches as instructed, even if you are feeling like you can walk unassisted. It is vital to not apply too much strain on your healing hip until you are cleared by Dr. Rozbruch. A cane may be used approximately 1 month following your hip replacement surgery. 2 weeks after your total hip replacement, any staples will be removed at an in-office visit. Driving is often permitted 1 month after a total hip replacement. Most patients are also able to walk without assistance roughly 6 weeks following their surgery. Once you are cleared to place your full body weight on your leg, balance exercises may be recommended to increase your steadiness. Final exercises may be implemented that mimic your day-to-day activities. These exercises will help you readjust to everyday life and perform activities without straining your healing hip. Unfortunately, some sports or activities that require a large amount of stress on the hip may need to be discontinued in order to reduce possible injury to your hip. At the end of your physical therapy sessions, your physical therapist will leave you with a set of exercises to perform at home. These exercises can strengthen your hip and thigh and can also be used if you ever begin to experience hip pain again. How can I learn more about hip replacement? To learn more about total hip replacement, please request an appointment online or call Dr. Rozbruch’s orthopedic office in NYC at 212-744-9857. Prior to an office visit, please fill out Dr. Rozbruch’s patient forms to expedite your first visit.